Without proper grip strength, it is hard to do most daily activities. Grip strength essential for many daily activities from turning a door knob to carrying grocery bags home. As such, it is good practice to exercise and maintain your grip strength for a better quality of life. If you’ve recently injured your wrists, it’s key to rehabilitate them through forearm strength exercises to improve your grip strength. For flexion and extension exercises, you can use either the semi-sphere by itself or the semi-sphere with the rod. To perform flexion and extension with the sphere only, begin by placing your palm on the flat surface of the semi-sphere with your fingertips pointing straight. To perform a flexion exercise, move your fingertips downwards and bend your hand forward. To perform an extension exercise, move your fingertips forward while bending your hand backwards. To perform a flexion and extension with the semi-sphere and rod, have the round part of the semi-sphere on the bottom and grip the middle part of the rod. For a flexion exercise, rotate your hand inwards towards your body. For an extension exercise go the opposite way with your hand rotating outward and away from the body. Supination and pronation exercises can also be done with semi-sphere and rod or just the semi-sphere. To perform a supination and pronation with the semi-sphere only, begin by placing your palm on the flat surface of the semi-sphere with your fingertips pointing straight. For a supination exercise, use the semi-sphere to roll your hand down and away from your body. For a pronation exercise, roll your hand downward and inside your body. With the semi-sphere and rod, place the round part of the semi-sphere on the table and grip the middle of the rod. To perform a supination exercise, roll your hand outward and away from your body so that your palm is facing outward. To perform a pronation exercise, roll your hand in towards your body so that your palm is facing outward. 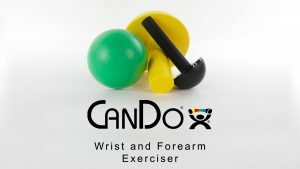 The CanDo® Wrist/Forearm Exerciser is a great tool that can assist in practicing wrist and forearm strength exercises. You can perform multiple exercises including flexion, extension, supination, pronation and much more. 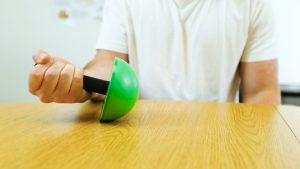 To see if the CanDo® Wrist/Forearm Exerciser is right for you, please consult your hand therapist. 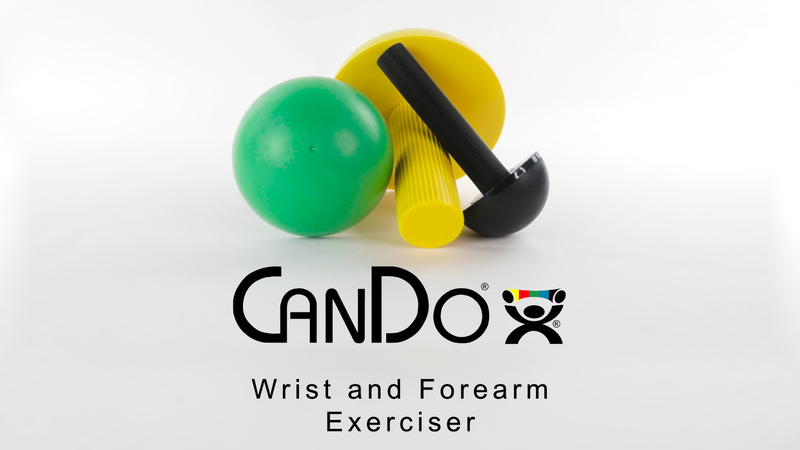 To check out the CanDo® Wrist/Forearm Exerciser, click here.